and made an S for spider. 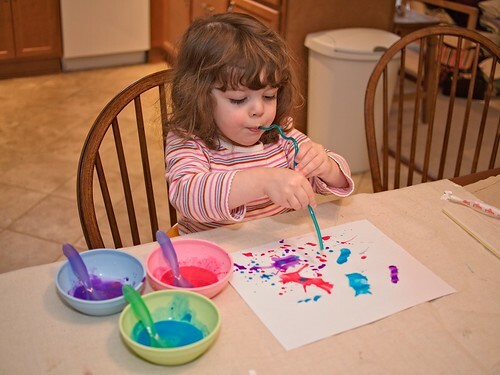 She did some abstract painting using a straw. There was also a bit of splattering with a spoon. G'Mom, Grampa, and Molly enjoyed some S'mores after dinner. Leah got in on the theme of 'S' week too. 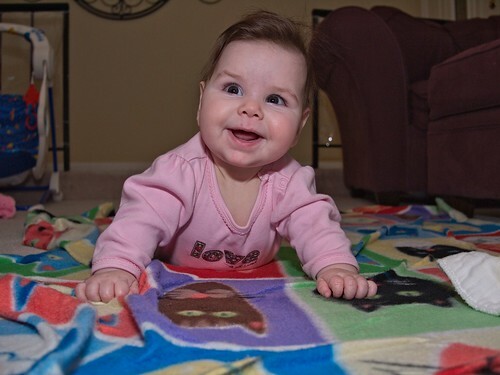 We started her on solid foods. 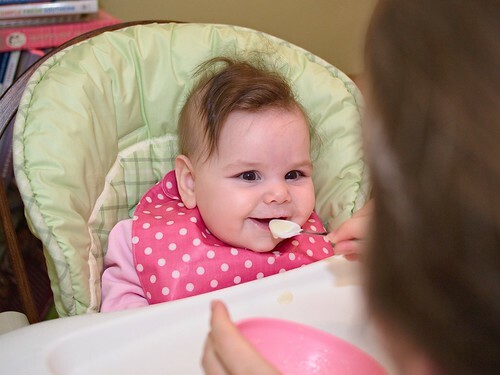 She's doing great and even seems to enjoy sweet potatoes, unlike her daddy and big sis! Most of our week was spent preparing for Molly's 3rd birthday party, so I didn't quite get to everything I had in mind. Today our little girl is 3! We've had a fun year. She's still the little dancer and now really gets her hips and arms into it! She also loves to sing and enjoys making up her own songs. It makes me happy to hear her singing the songs that I learned as a child. 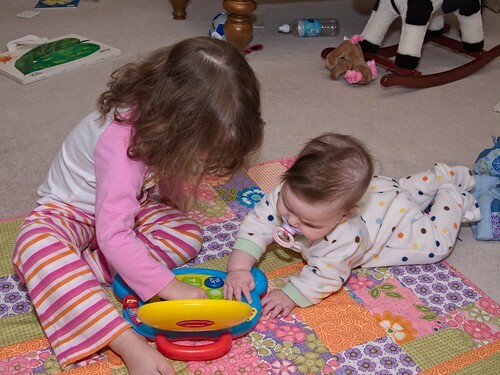 The best part of the year though has been watching her become the best big sister to Leah! 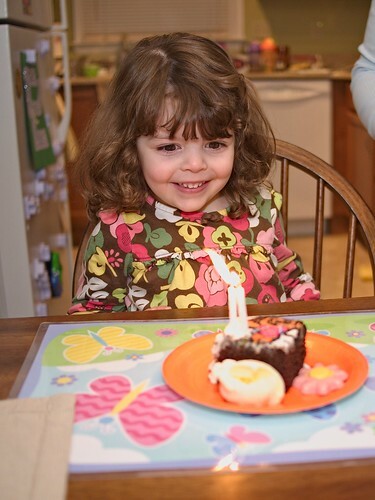 This weekend we had her Dora the Explorer birthday party with family and her friends. All the food followed the theme with fruit salsa, monkey bread, apple and cream cheese quesadillas, and monkey mix. 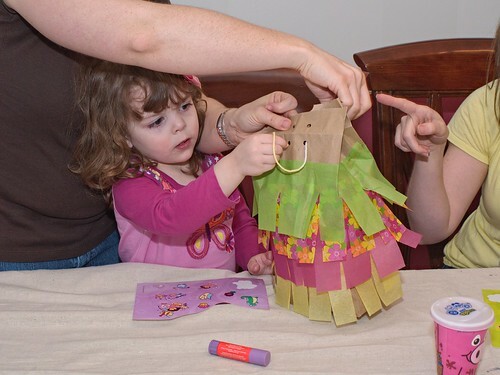 The kids created their own personal piñatas to take home as party favors. One of the hits of the party was this Dora guitar. Molly spent much of the time she was supposed to be opening presents distracted by her new toy. Molly was really excited have "Happy Birthday" sung to her. In fact, she got to hear it twice, as a couple of the kids missed the first time while they were in the bathroom. We of course also celebrated today on Molly's actual birthday. Chad and I tried to sing Happy Birthday to her first thing this morning and she started crying saying, "No, you can't sing without my cake!" 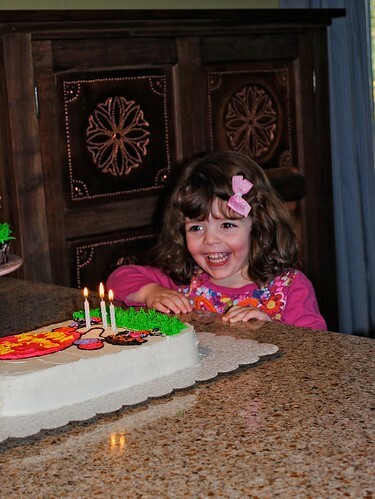 Molly was very excited to do the cake thing again. There are a lot more pictures of her party here. I participated in a secret sister gift exchange recently and one of the items to exchange was a hand-made gift. I had seen these fabric luggage tags and wanted to give them a try. It was my first time working with vinyl, which was a bit tricky, but they turned out very cute! 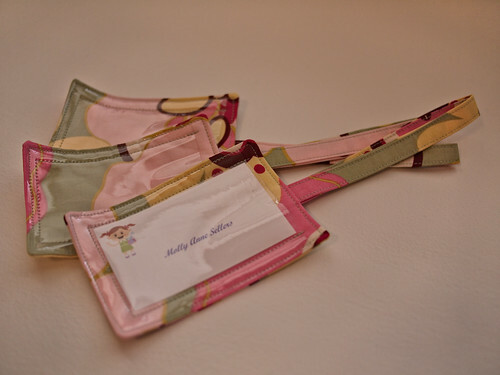 Next I'd like to try printing on fabric to make these custom fabric luggage tags. 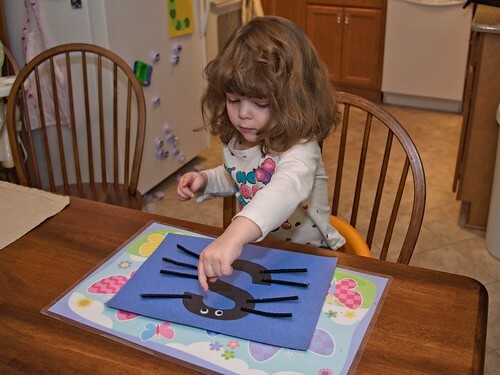 I'm linking up to Made by You Mondays at Skip to my Lou so you can see other fun, crafty things being made. 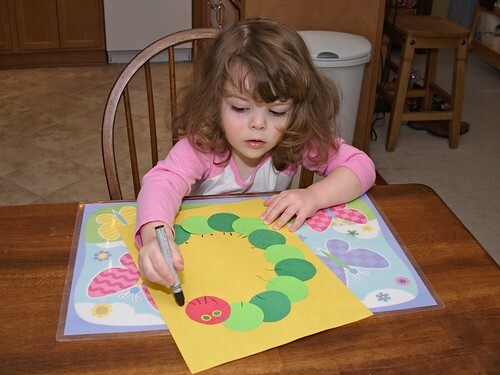 I chose to concentrate on the letter C this week because of all the clover activities I could do around St. Patrick's Day, and we didn't even do any of them! Leah has started exploring a lot of Molly's toys and especially likes the "McComputer" (as Molly likes to call it!). 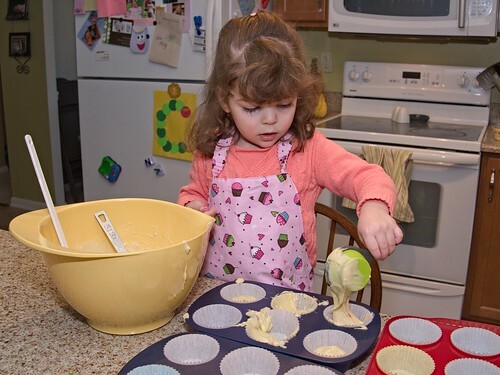 For our stART project, we read Spot Bakes a Cake. We decorated our cupcakes for St. Patrick's Day. 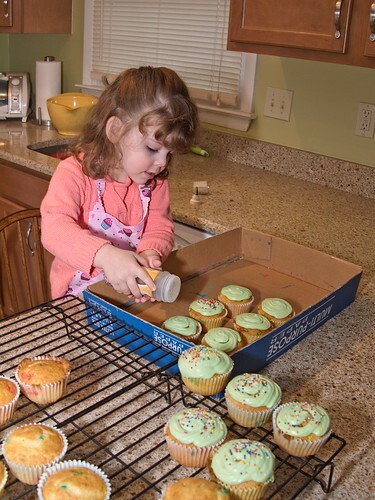 Molly worked hard on "tap tapping" the sprinkles on top. Then we celebrated the arrival of spring at the playground. 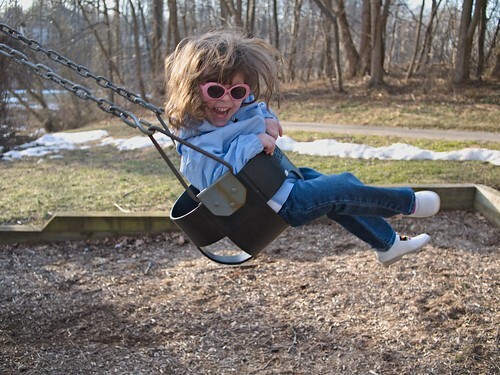 I think Leah is a big fan of swinging, just like her sister. What do you think?! And lastly a special trip to the zoo for Samson the baby elephant's 2nd birthday. 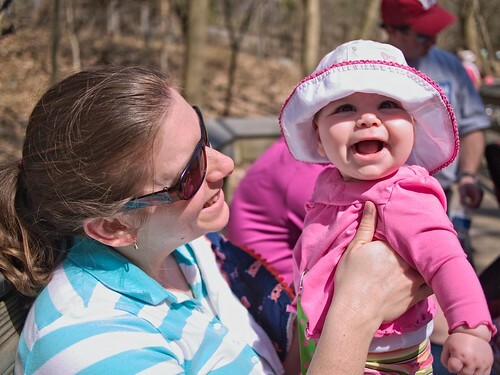 With the weather being so great this weekend, we were invited to go to The Maryland Zoo with Molly's friend, Sadie, and her family. 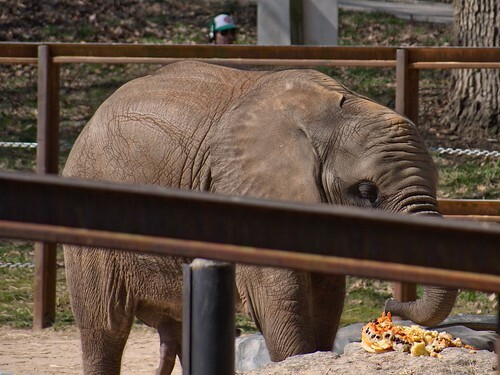 The zoo was celebrating Samson the baby elephant's 2nd birthday. We got to sing happy birthday and watch him (and the other elephants) eat some birthday cake. 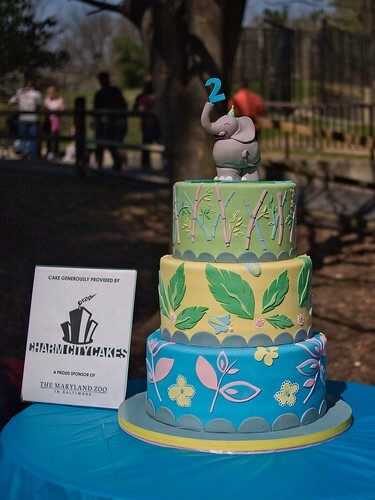 Don't worry, it was a cake made for an elephant. I saw oranges, grapes, carrots, and raisins in it. 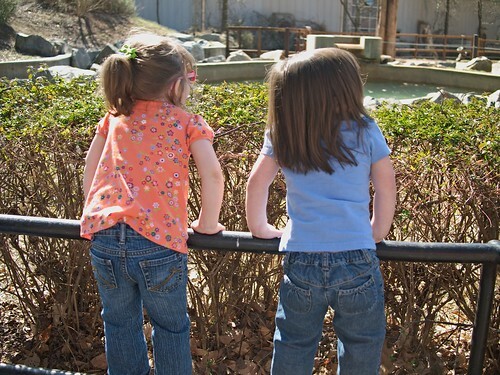 Here are the girls checking out the elephants. There was also a cake there from Charm City Cakes (the guys on the show Ace of Cakes), though this one looked like it was designed for human consumption, not elephant. 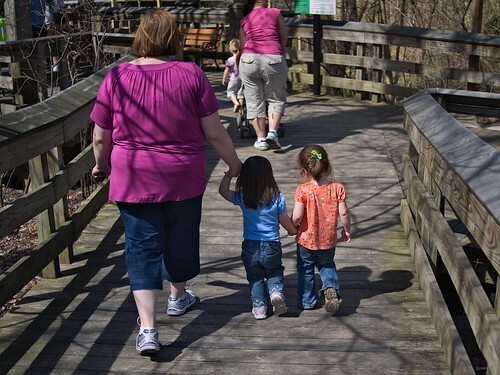 It was perfect to go to the zoo with just two families. The girls had someone to play with and we were able to move through the exhibits fairly quickly. Sadie was very loving toward Molly the entire day. 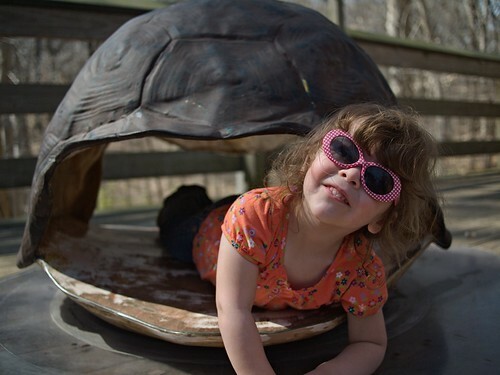 Playing in these turtle shells was a lot of fun. Molly and Sadie crawled in them and spun each other around. 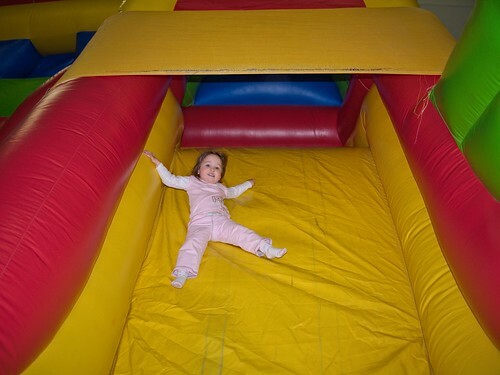 While most of the fun was a bit over Leah's head, Leah still had a great time. And who wouldn't have a great time when wearing such a cute hat. 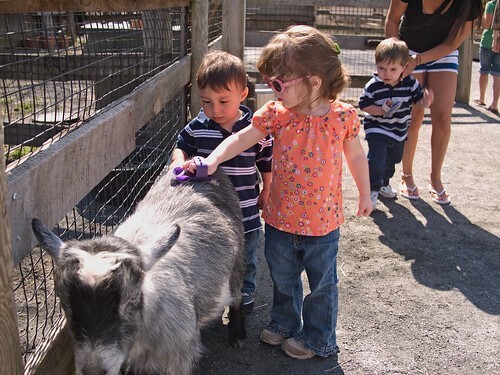 The zoo also had a petting zoo. Molly enjoyed brushing this goat and wasn't scared of it at all. 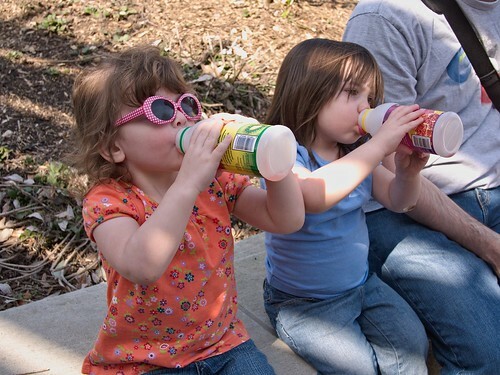 After a long day at the zoo, everyone was thirsty. Unfortunately, neither of the daddy's got to drink very much of their drinks once the daughters got ahold of them. Thanks, Melissa, for the invite! We had a great day! My friend, Kelly, is celebrating her daughter's birthday today. Happy 1st birthday Maya! 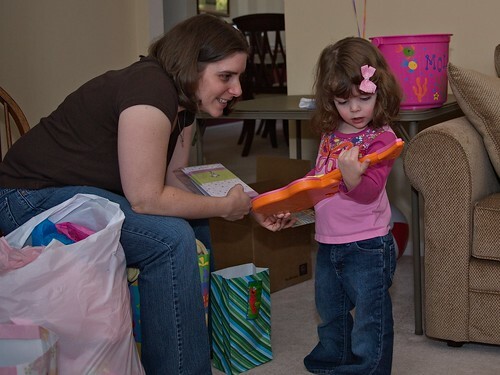 In lieu of gifts, Kelly asked for us to bring items to be donated to the JHU Pediatric ICU. 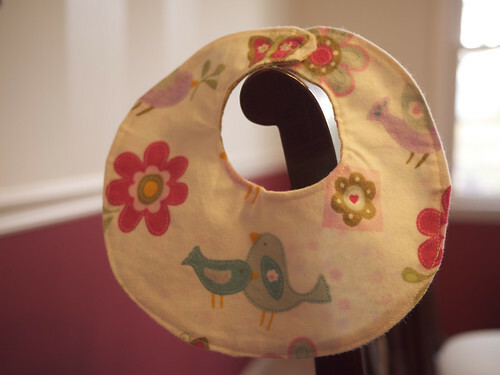 I recently found this free pattern for reversible baby bibs, so I decided to give it a try. 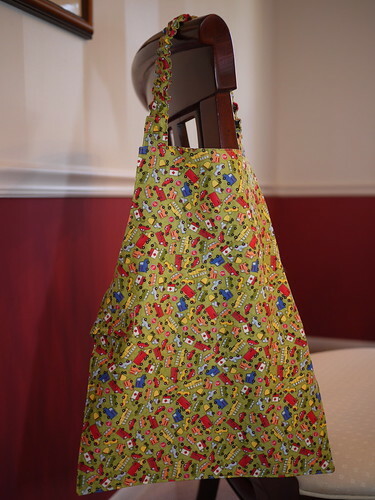 You can see the opposite fabric pattern peaking through. 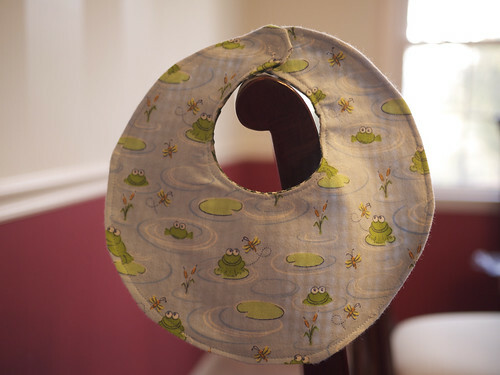 The neck holes turned out a bit smaller than I was expecting, hence the "newborn" title. I learned a few things as I went along, so I'll likely try a different pattern next time (like this one), but overall I was happy with how they turned out. 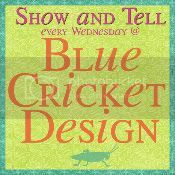 I'm linking up to Show and Tell at Blue Cricket Design so you can see all the other great projects people are sharing. We had a sick house this week, so our activities were limited. 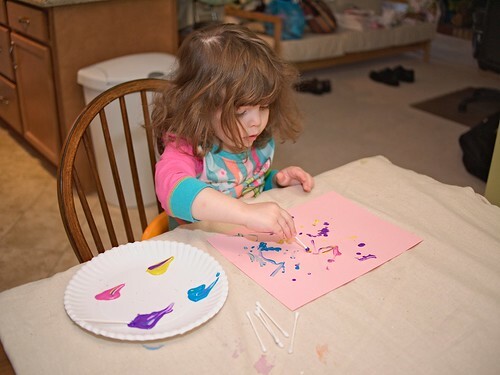 Our 'Q' week began with some q-tip painting. 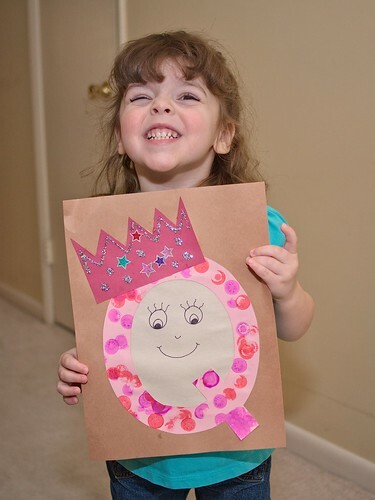 Since K was for king, we had to make his partner, Q is for queen. Don't you just love Molly's nice, fake smile?! 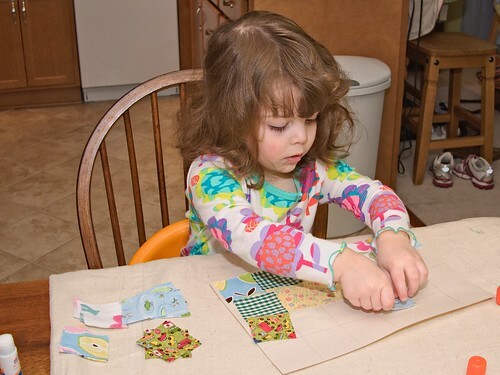 I cut small 2x2 fabric squares for Molly to make her first quilt, though it wasn't exactly the softest! By Thursday Molly really needed to get out of the house. We had planned to meet some friends at AirMania, so Grams came over to watch Leah, and Molly and I were off to jump off some energy on the inflatable toys! But mostly this week we enjoyed being able to play outside! 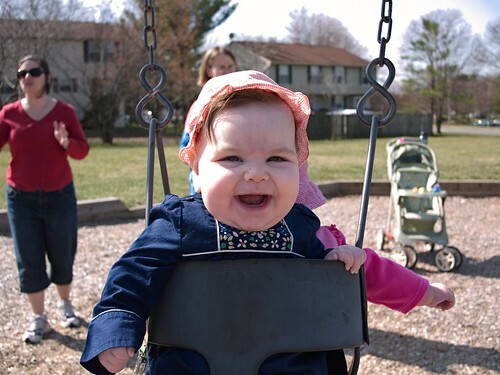 As you can see, Molly is very happy to be swinging again. The girls (mainly Leah) were a bit under the weather at the beginning of the week, so by Thursday Molly really needed to get out of the house. 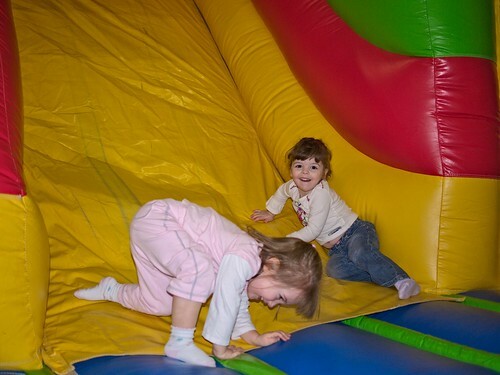 We had planned to meet some friends at AirMania, so Grams came over to watch Leah, and Molly and I were off to jump off some energy on the inflatable toys! The girls thought it was fun to jump and throw balls. 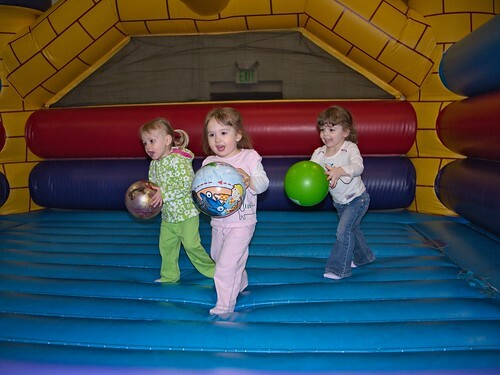 They'd throw them out of the moon bounce and then announce, "I need my ball, Mommy!" I got in and played with the girls. 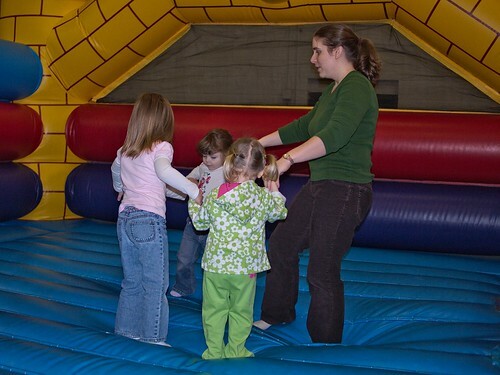 Ring Around the Rosie is great fun in a moon bounce! Molly would not go down the slides by herself, so no pictures of her sliding, but here comes Allison! 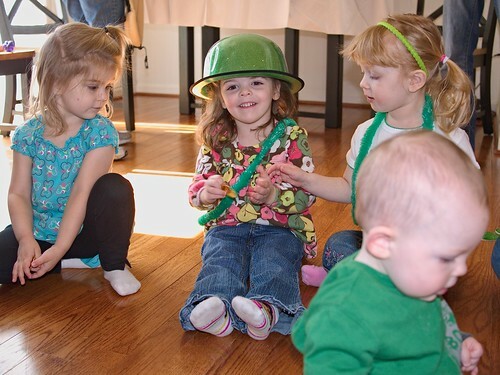 At one of our playgroup meetings back in January, Molly and two of her friends wore aprons the entire time. So, I came home and searched for a pattern to make one for her. 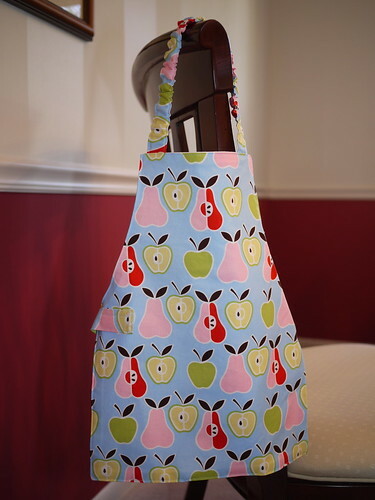 I found this free child's apron pattern at Sew Liberated and got to work. The montessori style allows Molly to put in on by herself. It has an elastic neckband and a velcro attached waist strap, so no assistance from Mommy needed! 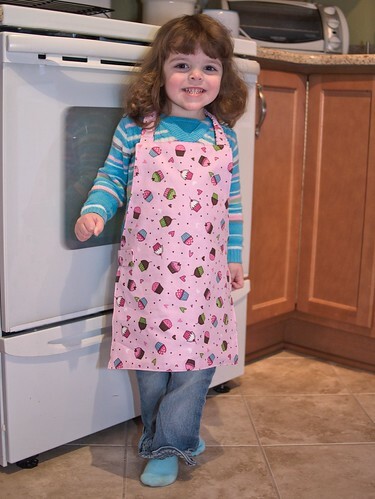 She loves wearing it when helping me in the kitchen. I have also made a few for gifts. I'm linking up to Strut Your Stuff Thursday at Somewhat Simple so you can see other fun, crafty things being made. 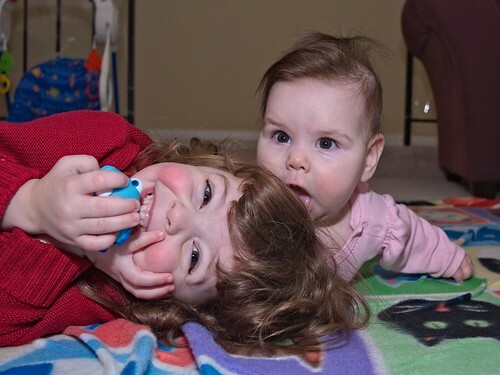 Molly and Leah really like playing on the floor together, though I don't think Molly realizes that Leah is about to taste her head! Leah's also doing much better pushing up and around on the floor. You can no longer leave her somewhere and expect her to be there when you look back at her.